Choices As I set up my leadership roles, I created a "Classified Ad" for students to look and choose their top three from. Application Once they choose their top three choices, I have them to "Apply" for their top choice using Google Forms. The following was given at the beginning of the school year. Interview My next step in the process is that I will implement next year is an interview process. Where the students will answer questions based on their first choice. See it. 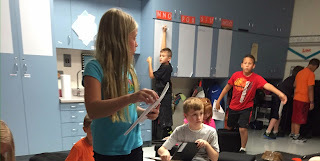 You are going to find pictures of my students leading their own learning. Read it. You are going to find a short summarization of what they are up too. Do it. You are going to be challenged to adapt it and try it with your own students. interact with the content by providing a mindweb-like result (not a list)research at different levelspersonalize their information by "pinning" facts they are looking forhave access to facts, websites with additional information, videos, and imagestake their own notes and turn them in (paid version... which is inexpensive)complete a bibliographyNOT BE SCARED OF RESEARCH Once introducing this jewel into my classroom, my students are more driven in looking for their own answers and are confident in the answers the find. How high do I want to go?How high do you want me to go?How high do I get to go?How high do I have to go?How high is that? These questions guided us through the last blog post as I discussed, in a professional realm, our reactions and responses. What about the application of these ideas to our classroom? Students face these questions as well... and there responses are no different than ours... the two factors remain the same: the what and the who. The what: What can we do as educators to personalize the content to make it matter?The who: What can we do as educators to gain and maintain a relationship? To THEM each student was unique!